not all of you were born with that quintessential shade of blonde that lightens to the most heavenly shade of perfection by midsummer … but you can look like you were. as many of you are aware, i am a firm believer in less is more when it comes to your hair. yes, although i am fully aware that i’m about as natural as sweet’n low, looking like you’re more natural is key. there is a shade of blonde for everyone. it’s finding the right one for you. if you have dark hair and wear very little makeup, stay away from going more than 2 shades lighter than your natural color when it comes to highlighting. if you like the makeup, you’ve got more room for change. this is all to prevent you from looking too washed out. if you’re hair is a more medium brown you have the ability to go pretty light. pinky/pale skin tones should aim for cooler or icier blond. yellow/peachy skin tones should stay warm and golden. if you were born with blonde hair or turned to a white/toehead in the summer… go for it!!! you can have this amazing platinum that missy is wearing below. her hair comes up beautifully on tone, and totally compliments her skin. for those of you that like to flirt with change, remember that too much can mean that your days are numbered. don’t expect to be a brunette every winter and a blonde every summer. your hair will hate you and i’m sure the feeling will be mutual. it’s best to do big lightening changes in baby steps. rome wasn’t built in a day and beautiful blondes can take time too. 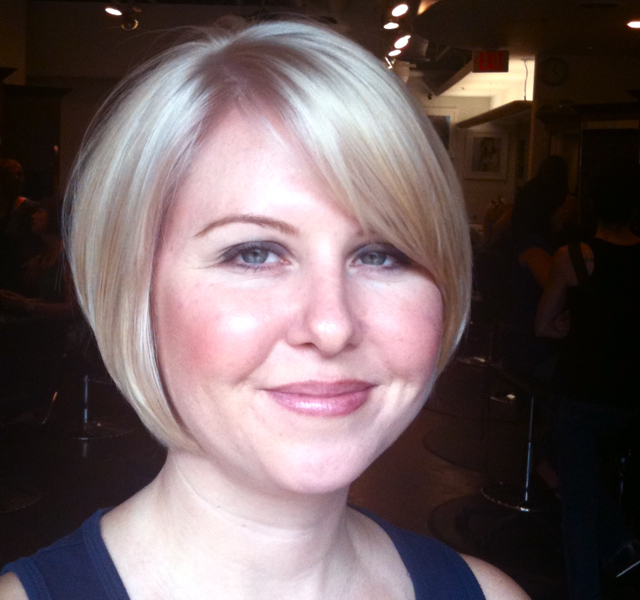 lighter shades of blonde always require more attention, treatments, touch-ups and tone. 1. be gentle on the hair when it’s wet. blonde hair stretches more than any other color due to possible stress on it’s elasticity. 2. it’s best to treat your hair once a week at home with protein and moisture. if you don’t care to maintain this at home, always get a treatment in the salon. 3. touch-ups on blondes must be maintained regularly. on scalp color must be done every 4-5 weeks while foils should be touched up about every 6-8 weeks. 4. the most important factor in what makes the blonde you wear right for you is tone. keep your goldie locks fabulous with color enhancing shampoos at home or toners in the salon that won’t take more than 30 minutes. there is quite a bit of fear on the streets about toners….so i hear. just a brief little description. they are pastel hair colors that neutralize unwanted tones in the hair. think; ‘eliminate brass and yellow’. i hope this has been helpful to those of you on the lighter side of the spectrum… or if you wish to go there. you too can ‘be blonde’ if you ‘beware’ and ‘be’ maintained. emails and questions are always welcomed. Previous Post it's a ten!!!! !